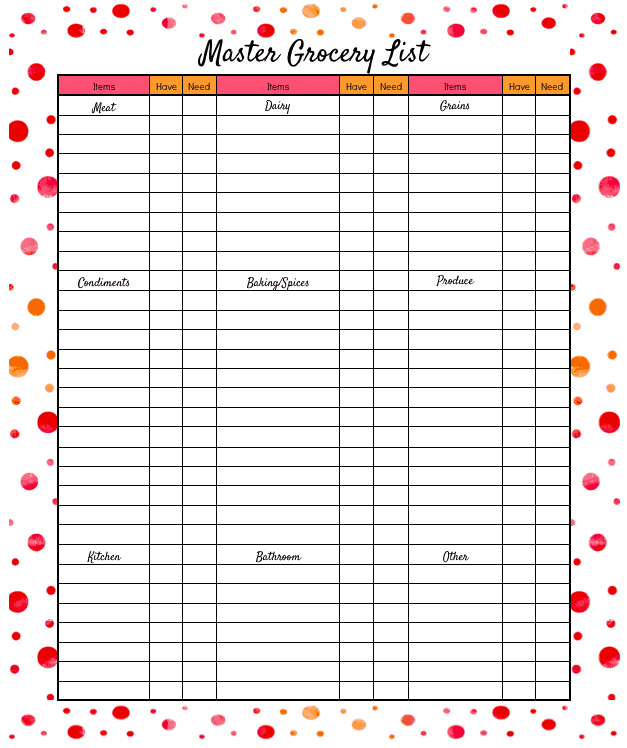 The grocery list in the Daily Life Planner free printables set will help you shop with a plan. It will also help stop unnecessary purchases and help you manage your pantry. You can find the rest of the Daily Life Planner – free printables here. If you have been doing either the weekly or monthly meal planning, you can now use it to make your grocery list. I have included three different forms because, let’s face it, we are all different. What works for one person may not work for someone else! You can see an example of my master grocery list below. This is not my actual one because I was trying to make it more usable for others. 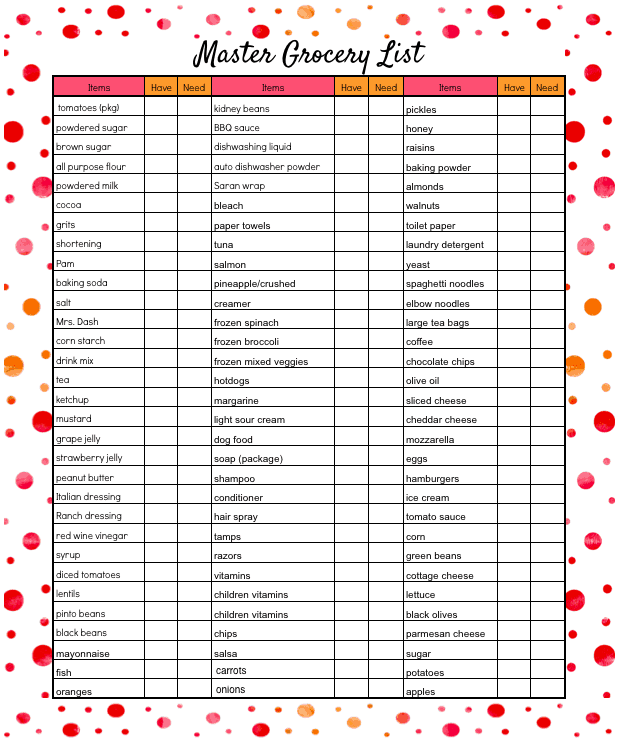 Basically, it is a list to help me check my pantry’s inventory of items we use monthly. I have the items we use listed with space beside each to write in how many I need. I shop BIG once a month. So, on my master grocery list, I have listed the staples that I use month after month. Using the list, I can quickly inventory what I have and what I need. I do make other trips to the store for fresh produce later in the month but, the bulk of my shopping is done once a month. I find that this saves time, gas and cuts down on impulse purchases. If you find headings more helpful, this one may work better for you. Again, there is plenty of room to write the items needed, how many you have and how many you need. And, for those of you who would prefer having a blank slate to work with – here you go! 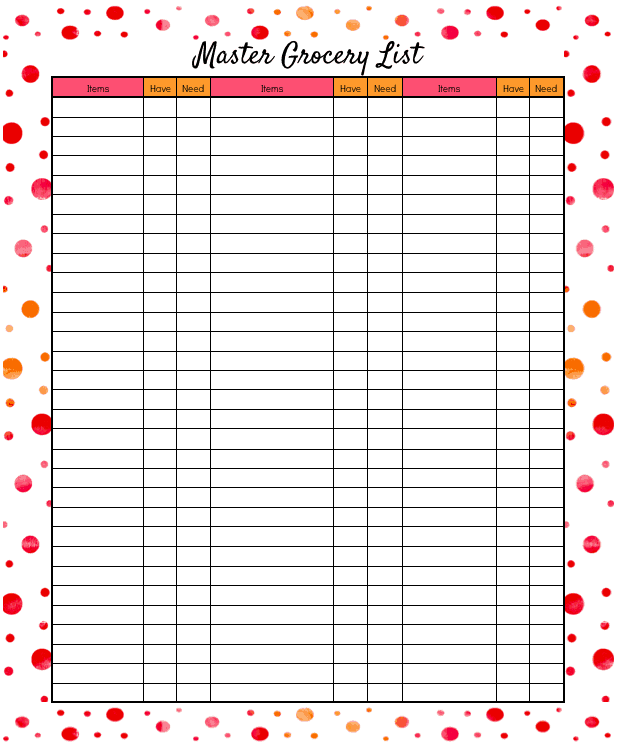 DOWNLOAD THE DAILY LIFE PLANNER – FREE PRINTABLES – MASTER GROCERY LIST PDF. INCLUDES ALL 3 VERSIONS!